Pen sized oscilloscope: Why will it change your life! The last decade saw a big change in the way electronics engineers work, and for sure, the tools and instruments they use everyday play a central role in this change. We, as electronics engineers, have seen this change and we have been a part of it. One important aspect of today’s electronics engineer, is that the frontier between pure electronics and programming has become almost non existent. This led Ikalogic to imagine tools that are perfectly adapted to this new workspace configuration, where computer screen with IDEs and PCB layout software are never very far. Today’s embedded developers usually need to perform quick diagnostic operations — sanity checks if you will — on a circuit board. Typically, one needs to measure a clock frequency, make sure if a power supply is stable, measure rise time or check if a PWM signal is correctly generated. A regular benchtop oscilloscope is usually an “overkill” solution to those kinds of problems. 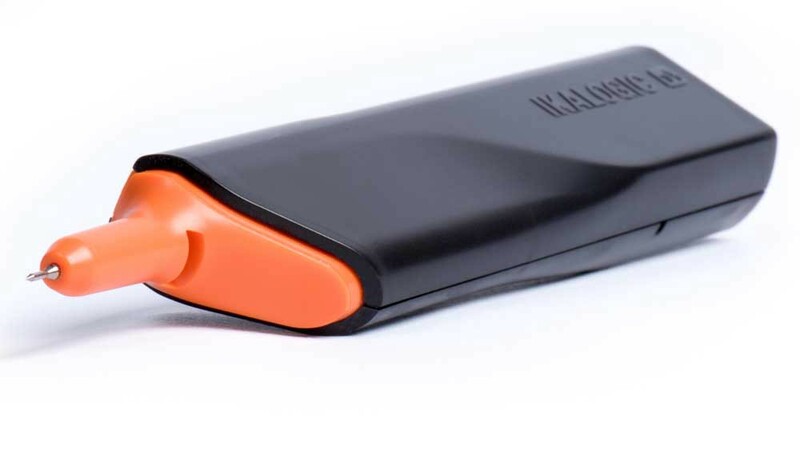 This is one of the main reasons why Ikalogic created IkaScope: a wireless oscilloscope probe that blends into today’s engineers workplace, just like a pen would. IkaScope offers extremely fast and easy measurements: You literally just need to press the probe tip on a pad or component’s pin on your PCB to see signals appearing on the screen of your smartphone, tablet or PC. Having only one channel, IkaScope won’t replace traditional 2 or 4 channels oscilloscope, but it was never meant to in the first place. Think of IkaScope as a new kind of instrument: Something more personal than a benchtop oscilloscope, that you can carry with you everywhere to get quick insight into an electronic circuit that needs debugging. IkaScope ultra portable oscilloscope fits in your hand! So seriously, how will IkaScope help me in my everyday job? Looking at a power supply. That may seem like a simple task, and many would quickly grab a voltmeter for that purpose, but it’s a mistake. Glitches on power supplies are very common symptoms of bad hardware design or missing capacitors, and only an oscilloscope will give you a clear information about the quality of your power supply. For that purpose, when a voltmeter is not enough and an oscilloscope is considered as being too much, IkaScope offers the best compromise. Differential measurements can be breeze! If you ever had to measure current by looking at the voltage across a resistor, you know you’re not allowed to connect your oscilloscope’s ground anywhere, otherwise, ground loops may occur which would harm both you instrument and device under test. IkaScope totally solves this problem since it’s battery powered. It’s isolated by design, so you can easily perform differential measurements on any two signals on your board, without any additional differential probe. Seeing what a logic analyzer won’t see. Although a logic analyzer is by far the most powerful tool when it comes to debugging a serial interface (like I2C), sometimes, you need to see what happens at a very “analog” level. Some hardware faults on serial interfaces can only be seen with an oscilloscope, like one signal getting stuck in a level that is somewhere between logic 0 and logic 1. Again, IkaScope here can give you an answer in a matter of 10 seconds, provided it’s lying on your desk!